In unseasonably warm weather, hundreds of thousands of Americans flooded the nation’s capital for the 45th annual March for Life, calling for the end of the slaughter of innocents through the unspeakably barbaric sin of abortion. Members of America Needs Fatima united with so many others in order to bring about the end of the Culture of Death. felt like a gift from Our Lady. 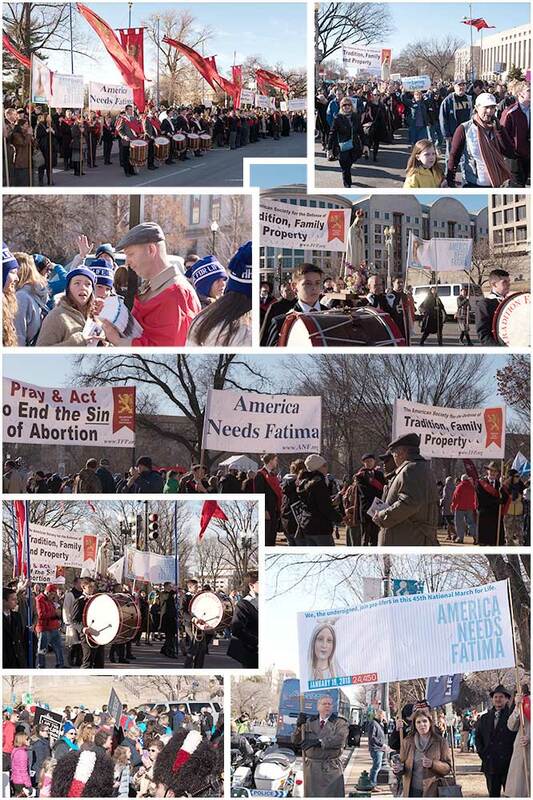 Proudly bearing the names of 24,450 supporters added to the America Needs Fatima banner, our volunteers marched shoulder to shoulder with pro-lifers young and old. The sheer number of marchers was staggering. It took a span of nearly two hours for the constant stream of marchers to pass by the Holy Choirs of Angels Band. The band members stood vigilantly in their usual spot, this time not having their fingers frozen as in years past. The beating of drums and clash of cymbals, trumpet fanfares and the captivating sound of bagpipes rang throughout the crowded streets of Washington. The music performed by the Holy Choirs of Angels Band helped give an upbeat and determined attitude to the resolute pro-life warriors marching. The message distributed by the American TFP was one of hope and confidence. The TFP’s 2018 statement, A Tale of Two Marches: Reasons for Hope and Confidence, encouraged the marchers to confide in God’s grace. It also exhorted everyone to keep the pro-life message firm and strong. One can never water the pro-life message down. The core of the pro-life movement is the absolute rejection of the Culture of Death in all its many forms. The core of the message? Never compromise. The pro-life movement gained some serious wind in its sails during President Donald Trump’s first year in office. The Trump Administration has consistently supported the pro-life march. Last year, Vice President Mike Pence was the first vice president to personally address the March for Life. Victory belongs to those who fight and persevere to the end. It does not matter how hard, trying, or seemingly impossible. The victors are those who overcome all obstacles and have their eyes on the prize. Nothing should impede their desire to reach that goal. With this hope and confidence, they will conquer. Better yet, God will triumph, and the Culture of Death and all its forms will be defeated.